Firstly, some weeks ago we were asked by the Bavaria Owners' Association to write a short article about how we came to be living aboard a Bavaria. It has now been published and you can read it here. They have now asked for a longer article for the next edition. 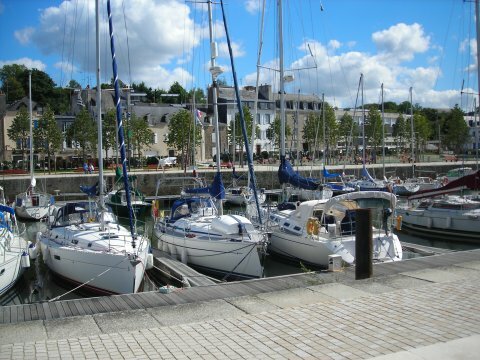 Although the winter seems some months off, we wanted to secure a berth so had, in previous weeks, emailed several marinas - La Trinite, Vannes, La Roche-Bernard, Rochefort and both marinas at La Rochelle. As liveaboards, our criteria for a winter berth are fairly simple, but not always easy to find - shelter from weather, security, WiFi access, decent shower facilities, launderette, supermarket and shops nearby. These criteria are somewhat different from those when we are just visiting places - the mundane aspects of living aboard will take on a greater significance during the wetter, colder winter months. For various reasons, we narrowed the choice down to either Vannes or La Roche-Bernard. As there are still some lovely places to explore nearby, we didn't really want to rush too far south just yet. 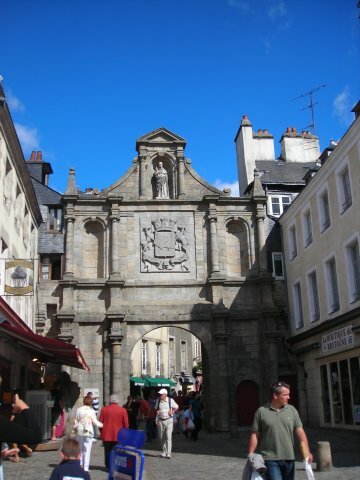 We had heard from several people that Vannes is a beautiful city with the marina right in its centre. 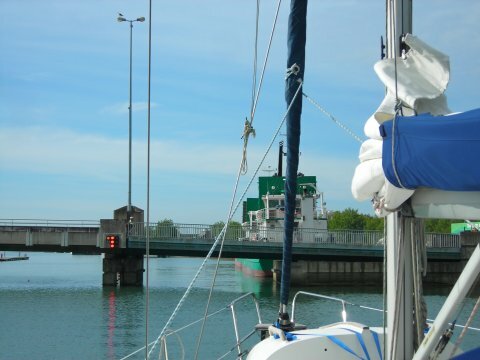 So after filling up with diesel we left La Trinite last Wednesday, in loose company with Phil & Val on 'Somewhere', and headed for Vannes, at the end of the Morbihan inland sea. 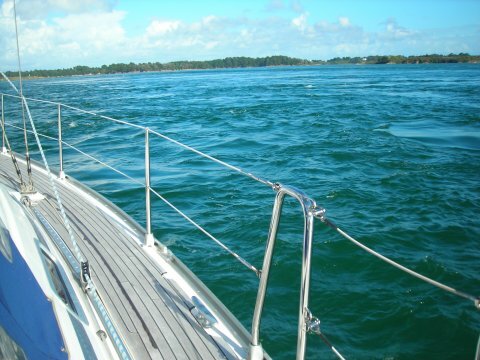 We had a great sail under just the genoa, initially slightly reefed to maintain the speed we'd set to time our arrival at the entrance to the Morbihan, and its infamous tidal streams, correctly. 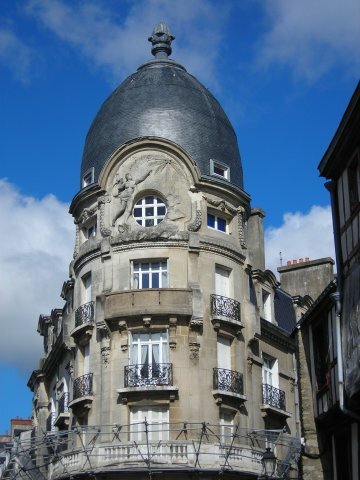 The plan was to enjoy Vannes for a few days as well as reconnoitring it as a possible winter stopover. We intended to hire a car to visit La Roche-Bernard, allowing us to make the final decision on our winter home. 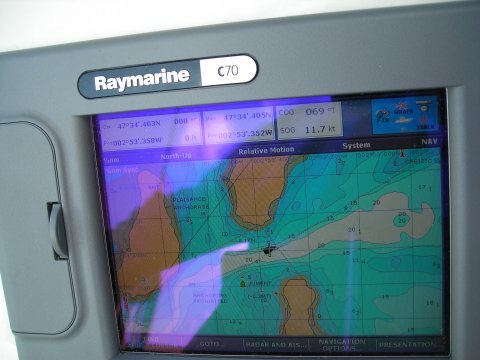 Sailing into the Morbihan for the first time was an interesting experience and we were glad to have made the decision to furl the genoa just before the 'action' started. We'd timed our passage perfectly to arrive at the entrance (Port Navalo) half and hour before high water there, as the pilot guide recommended, and then carry the flood all the way to Vannes, where high water is two hours later. We'd read about the strong currents at the entrance and throughout the Morbihan and it certainly lived up to that reputation - the entrance was like being in a washing machine! It was slightly surreal to see yachts in blissfully peaceful anchorages just out of the tidal streams as we raced past them, recording a top speed, with the engine barely above idle, of 11.8 knots over the ground. It was rather like a water amusement park ride at times, the water bubbling and whirlpools churning around us, Pipit occasionally veering off in a different direction for a few seconds as a new cross current took hold of her. I thought we were going to top 12 - peaked at 'only' 11.8 knots! 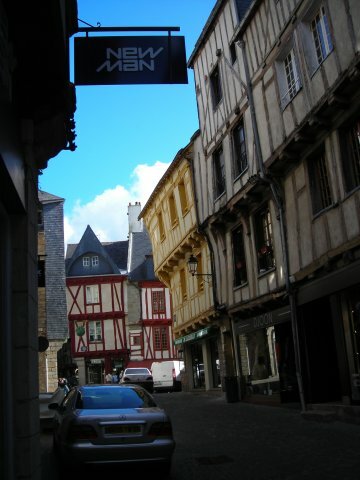 Vannes is indeed a very lovely city - nestled under the ramparts and amongst beautiful old buildings is a huge array of shops full of wonderful things, including various epicurean delights. The marina is literally a few steps away from the quay in town with no security onto the pontoons. As we discovered, this allowed various 'youths' to wander unchallenged on the pontoons, leaving us feeling that we and Pipit would be a bit vulnerable staying throughout the winter. There was also the constant noise you'd expect in any city - traffic and sirens at all hours of the day and night and a general hubbub. More worrying were the sounds of 'young' people on their way home from nights out and the subsequent shouting, bottles being broken and at one stage, possibly one of the city rental bicycles being thrown into the harbour, waking us on several occasions in the wee hours. The marina facilities (showers and launderette) are all brand new and very good, but can be a long walk, over 1km in fact, if your berth is on the western side (as ours was during our visit, and there was no way of knowing where our winter berth would have been). The Capitainerie was very friendly and helpful during our stay. 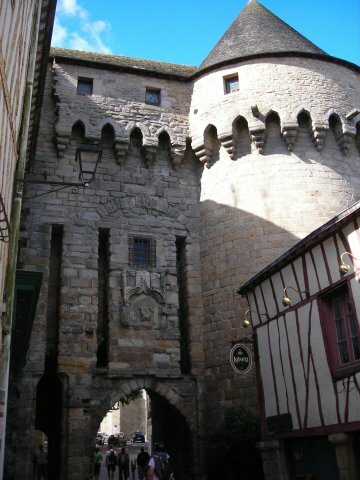 However, having ruled Vannes out for a winter berth, we were hoping that we'd find La Roche-Bernard a better option. 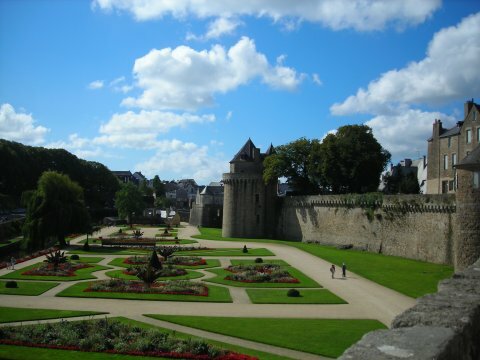 Well manicured gardens below the ramparts. 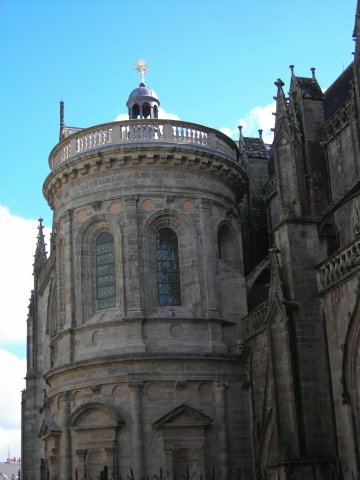 We left Vannes on Monday morning and made the short passage back out of the Morbihan to Crouesty. We'd been advised to avoid this marina, and can't remember why but assume it was because it isn't the most scenic place to visit. 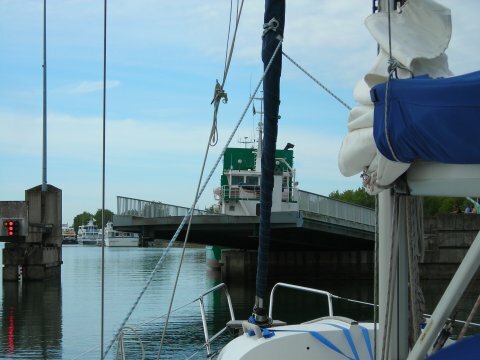 It is just an enormous marina with 6 basins and, as such, has no inherent beauty, but we are spending a few days here so that Andy can do some work, Ann can do some washing and shopping and we can plan a few days in the Morbihan exploring amidst the islands. So Crouesty actually suits our requirements for a few days - the showers and launderette are good and very close to the visitors basin, there is a large supermarket, a fish market and WiFi. Pole position at the road bridge just downstream of Vannes. 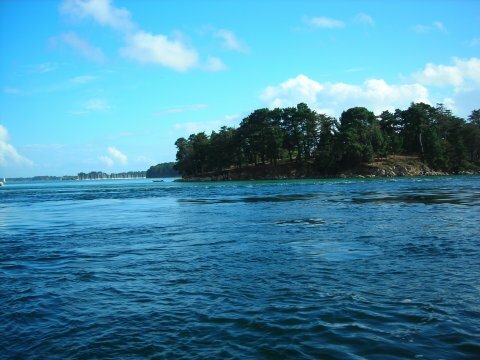 As much as we are looking forward to spending some time next week pottering (well, not sure you could call it pottering with the strong tidal streams) in the Morbihan, we are equally looking forward to 'settling in' at La Roche-Bernard for the autumn and winter. We will still be able to get out to sea if we want, or more likely take Pipit or Nessie (the dinghy) up the Vilaine to explore. There is undoubtedly plenty of walking inland and along the river banks. For any of our friends who fancy an autumn or winter break, there is a campsite right next to the marina in La Roche-Bernard as well as various places to stay in the town - we'll investigate further when we're there, and you may find something of interest here.